After months of preparation, the main check-out desk served as a bar. Computer kiosks were replaced by cafe tables. Jazz echoed among the murals and book stacks. The Brockton Public Library was transformed into a jazz cafe and hundreds of partygoers supported the Brockton Library Foundation, the Brockton Historical Society and the Greater Brockton Society for Poetry and the Arts. 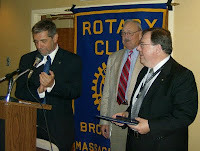 Bob Tufts asked me if I would serve as Master of Ceremonies at his Installation as the new President of the Brockton Rotary Club, and I was honored to agree. Part of the ceremony was for outgoing President Lew Victor to give a farewell address and wrap-up of our successes during his Presidential Year. Lew announced that among his final duties would be naming two new Paul Harris Fellows. This is one of the highest honors a Rotary Club can bestow upon its members. I was thrilled when Brockton Emergency Management Administration Director Morton "Mort" Schleffer was presented his medallion and certificate. I was humbled, honored and thrilled some more when Lew announced that I was the other recipient. Mort is the handsome guy shaking my hand. Lew is the handsome guy at the lecturn. I am the funny looking guy, wearing my ever-present City of Brockton lanyard, holding the award.